Autodesk—one of the old-line tech companies with the greatest commercial opportunities in new-line 3DP—enjoys leadership that can talk. Better: take the stage and educate, authenticate, prognosticate…AND inspire. 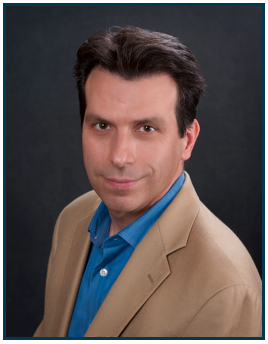 Andrew Anagnost, Autodesk Senior VP, Industry Strategy & Marketing, does corporate strategy as stand-up comedy at MakerCon New York 2014 on 18 September 2014. With this last, inspiration moves and compels—powered by the corporate vision Autodesk foresees. This is all while promising to lead individuals and industries to a new commercial and common-good reality. And—not surprisingly—a reality ADSK (the stock symbol Autodesk often uses for internal short-hand) will help them to fulfill. I’ve marveled at the room-mesmerizing presentation craft of Autodesk’s Carl Bass—President & CEO—at other 3DP sector events. You can’t help but love Carl’s—you immediately want to be on a first name basis with this guy—aw-shucks / off the (rolled-up) cuff / wander-the-stage delivery of disruptive ideas. Carl’s opined concepts are the kind guaranteed to make short-sighted Wall Street analysts quail in fear of ADSK equity value. Now, MakerCon Day 2 showcased yet another Autodesk senior spokesperson with stage chops and provocative revelations: Andrew Anagnost, Autodesk Senior VP, Industry Strategy & Marketing. MakerCon was Maker Media, Inc.’s debut of its first “Maker Movement Conference” in New York City—more or less for “professional makers”—on 17 and 18 September. This was just before Maker Media’s “Flagship” World Maker Faire New York 2014. MakerCon consolidated a number of prior events around World Maker Faire—including the Hardware Innovation Workshop, a clinic on making Maker Spaces and Education Day. So, on Day Two—compliments of Autodesk strategic positioning and clearly of a piece with a new corporate-storyline of serious intent—we laughed with light-footed Andrew Anagnost. His comedic schtick served to spotlight a profound juxtaposition. Andy (another at-ease first name!) casually walked about and talked about killing his company’s “children”—his established corporate products—before emerging assassins murdered them in the heartless marketplace. 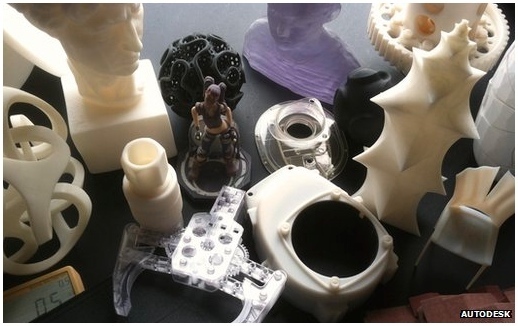 A potpourri of 3D-printed objects created using Autodesk software. I’m circling back to comment in detail on THIS particular MakerCon presentation for key reasons. I believe Andy Anagnost’s speech points the directions of major drivers of 3DP—including new engines of the company’s business model, its ubiquitous software and Autodesk (itself!). Thus, I’m convinced this Autodesk exec’s talk is of high importance for those who would understand where we’re going in 3DP—and who is leading us there. SVP Andy framed his comments with the impact of digital tech, infinite computing power (“a supercomputer for everyone”) ubiquitous sensors, mechatronics—and the subsequent rise of human-complementing(??) robots. As result, the workforce is becoming “nomadic” and/or working virtual. So, Autodesk is now convinced it needs to create software tools that can perform exceptionally in this disruptive new environment, too. Tracking the advent of “smart everything,” ADSK is now addressing the intellectual elements of manufacturing. If our making systems are becoming more and more clever, we have to be cleverer still—in turn—about how we manage such powerful production assets. From both a commercial AND—implicitly—a common-good perspective. The Local Motors “Strati” 3D-Printed, open-source, crowd-designed-winner car parked in front of MakerCon New York, NYSCI—”built” in 40 hours of realtime printing on a public exhibit-stand at the Intl Manufacturing Tech Show 2014 (in Chicago Sept 8 to 13, McCormick Place). Photo compliments J. E. Earle/Eventifier. Andy talked of “Fabless Manufacturing” of the (very near!) future where we will consolidate our making in shared facilities. 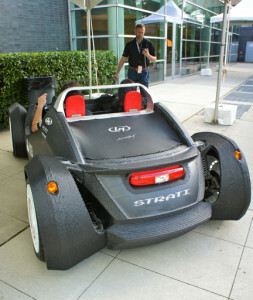 He pointed to Local Motors—an Autodesk Spark-platform strategic partner—with that disruptive car-making startup’s dispersed production and “delivery” plan. 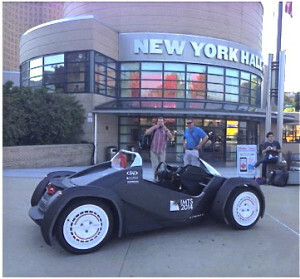 Underscoring this point—vividly and palpably—was Local Motor’s first-ever, open-sourced (and fully operational) 3D-printed runabout—the Strati—sitting at the front curb outside NYSCI’s central-building complex at the WMFaire-grounds in Flushing Meadows, Queens. SVP Anagnost predicts high-performing societies around the world will begin to engage in a “Consumption Shift”—driven from the bottom up. This will start in the Golden Grassroots with high-margin buyers. These Discerners will insist on knowing—and thereby educating and modulating their intake—about the provenance, pluperfect performance specs and the post-usage arc of the products they buy and services they consume. How, where, when and by whom was it made/served? How long will it last? Is it toxic on any level? Is it sustainably disposable? Rear deck of the Local Motors “Strati” 3D-printed, open-source operational car parked outside MakerCon NY ’14 at the NYSCI complex in Flushing Meadows, Queens; standing in the background is Jay Rogers, Local Motors’ CEO & Co-Founder. These high-end expectations will diffuse through the other strata of every developed society. In consequence, these changing buying/consumption patterns will drive a fragmentation of demand. Challenging client/customers are going to insist on bespoke solutions—and 3DP will enable playing to such exigent stipulations. These new and different expectations will call for unprecedented customization regimes. Adding another entire level of intelligence “aboard” or (abroad! ), every product will automatically join the Internet of Things (IoT)—unless sequestered for different reasons. Along with other “ho-hum” presumptions, customers will assume hyper-local and/or cloud linking of even mundane products: a soon-to-be unexceptional expectation of Net connection. According to SVP Anagnost, another Autodesk strategic vision is the Evergreen Product. Major consumer systems (think your automobile or your washer-dryer) in your life will be iPhone-ized. Many consumer electronic products are regularly upgraded with new software releases. Because your car or washing machine’s digital intelligence will be wirelessly integrated into the IoE—and entirely empowered by software combined with protean hardware—it will “evolve” overtime. The system will present you with new software upgrades—with novel functionalities and value-adds—as your vendor strives to keep you connected. That’s both to the IoE and to his/her company. Tesla Motors—one of the two most innovative auto makers on the planet (the other is Local Motors)—is already promising that “we’re going to make the [Tesla] car better [on a current customer-specific basis] over your time of ownership.” And—you guessed it—Autodesk is ALSO a strategic partner of Tesla…strange how that seems to be working…! 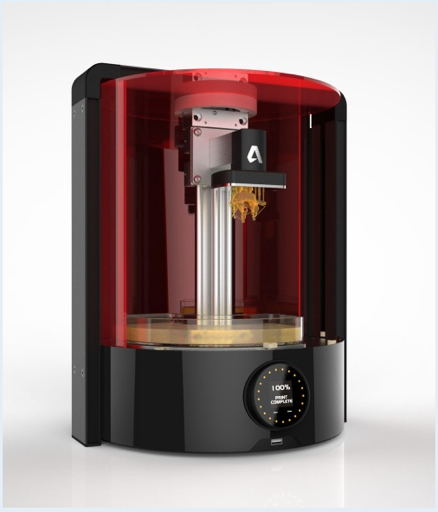 To move the company’s agenda ahead as rapidly as possible, Andy of ADSK is out to create a “3D literate consumer class”—and an integrated 3DP ecosystem for that group to play in. Autodesk’s (yet to be named or released) STL, semi-pro, desktop 3D Printer: a will-be working and for-sale “proof of concept” to demo the new ADSK Spark software suite—as much as a market-targeted hardware launch. Primary elements of this “literacy” strategy include free software products for schools and universities; new ancillary “tools” like Fusion 360, cloud-based CAD/CAM for collaborative development and 3DP output; the free “Spark,” open-source, 3D-printing software platform (as an operating system to drive many varieties of 3D printers); and the company’s own ADSK 3D printer. These last two key elements are likely to be further profiled—and the no-name printer officially debuted(?? )—at the “Inside 3D Printing Santa Clara” Conference and Expo on 21 to 23 October. 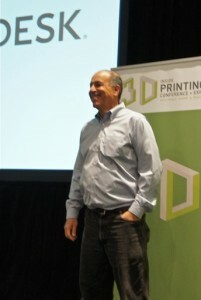 Carl Bass, President & CEO of Autodesk, presenting his Keynote at “Inside 3D Printing” at the Javits Center, NYC, on 4 April 2014.